Custom Move. Added Custom Move, Custom Copy's sister, a fully configurable, queueable, verifiable, and backgroundable move operation. Custom Move offers a strong alternative to the standard Windows Shell move featuring all the goodies that Custom Copy (introduced in 10.00) has to offer. Both intra-volume and cross-volume custom moves optionally provide automatic rename-on-collision, which is a wonderful thing for everybody who up to now has wasted his life with the Shell's move implementation. On cross-volume moves, each file is first copied and then (after optional verification of the copy's correctness) the source file is deleted. Ultimate safety for your bytes. For more features please see the list under Custom Copy. Undo. Now Custom Copy and Custom Move support multi-level Undo/Redo. Single Click Open. Now you can optionally open list items by a left button single click on their icon. Simply tick Configuration | Extended | Single click on icon opens items in list to open list items by a left button single click on their icon. It will trigger the same action as if you double-clicked the item. The action is triggered on MouseUp. attrstamp("r", , "E:\Test\x"); //set readonly to "E:\Test\x"
For frequent use you can easily wrap such a line into a user button and/or assign to it a keyboard shortcut of your choice. Thumbnails. Added configurable multi-line captions (up to eight lines), so also longer filenames can be fully displayed in Thumbnails and Large Icons views. Note that also long filenames without any spaces are wrapped, preferably at hyphens and underscores, ultimately at any character. 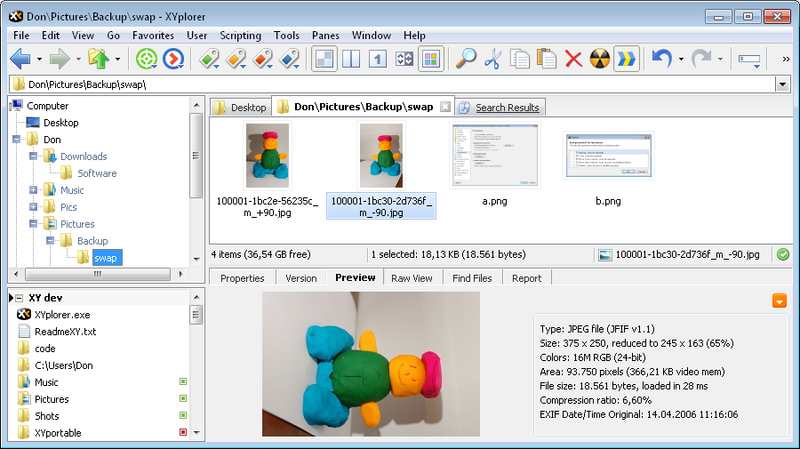 This thumbnail view is configured for two caption lines (up to eight are possible). 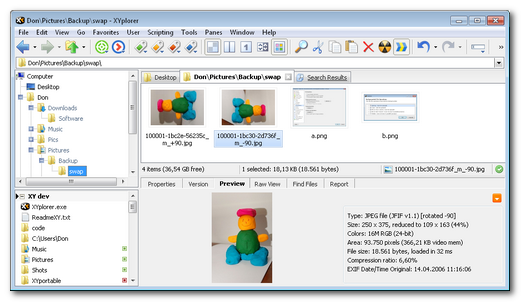 Note that also filenames without any spaces are wrapped. Auto-Rotate. Now Image Preview and Thumbnails support auto-rotate for JPEGs and TIFFs. Digital cameras with orientation sensors allow auto-rotation of portrait images by reflecting the positioning of the camera with respect to the ground in the picture's EXIF data. 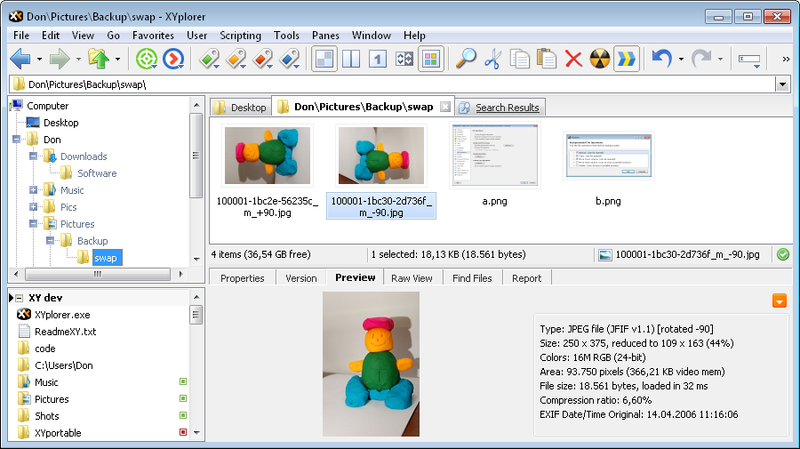 To enable Auto-Rotate for the Image Preview, its Mouse Down Blow Up, and the Full Screen Preview, tick Configuration | Preview | Auto-rotate preview. 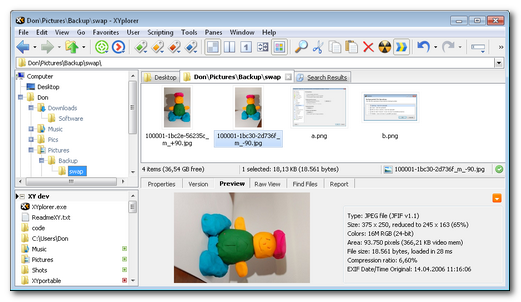 Tip: You can as well toggle Auto-Rotate for the Image Preview in the orange button dropdown menu on the Preview panel. To enable Auto-Rotate for the Thumbnails and their Mouse Down Blow Up, tick Configuration | Thumbnails | Auto-rotate thumbnails. Here the image preview is auto-rotated but, for demonstration purposes, the thumbnails are not. Here the thumbnails are auto-rotated but, for demonstration purposes, the image preview is not.